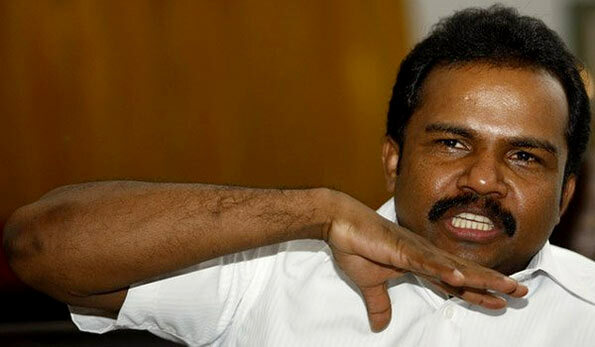 Former Deputy Minister Vinayagamoorthy Muralitharan alias Karuna Amman has been arrested by the Financial Crime Investigation Division (FCID) on Tuesday morning. Police stated that Karuna Amman was summoned to obtain a statement regarding a vehicle he used during his tenure as a Deputy Minister. Police added that Karuna Amman has not handed over the said vehicle to the state. So called dirty man wij***sa Ra***akse should be taken into custody for attacking e news editor. Oh! that a new one. How were the old ones begun ended? This is gift given him?Without Mr Karuna impossible to end Sri lankan ethnic civil war and he did helped many way goverment fight against LTTE terrorist.Really very sadness to arrest him. Oh these are eye viping case, cinematic.black money monsters and huge money crocks are simply roaming around the nation, especially rajapakse family and most politicians including ri***d ba***deen, wi**l w***wansa and many more. Capture the crocks, catching the frogs rather. This is the joke of the decade. There’s plenty of evidence in the public domain about the atrocious activities of this person including killing of 142 Muslim worshipers in Katankudi, killing of 600 Police officers in captivity, killing of 54 Buddhist Priests at Aranthalawa, bombing of the Dalada Maligawa and killing of several Tamil Politicians and Tamil civilians. Also, he travelled to UK on a forged passport and illegal visa organised by a bigwig of the MR1 regime; he was found guilty, served a prison sentence in the UK and was deported. Arrested only for misappropriation of the vehicle!!. He will be bailed out on Dec. 07 and will live as a free man. This is Yapalanaya. Murderers roam the lands, free men, continuing to terrorise the innocent civilians while the Boss is writing to the trumpeter to let us free of war crimes. Karuna played one of a major role to eradicated the terrorists gang . Without him it was not so easy. There are so many ministers doing more corruptions, they looted CB bond money, using government money to provide jobs to their own people. Investing government money to the wrong failed projects. Example, If PM appointed any person and that person did something wrong which created a major havoc to the country stability/economy should resigned immediately. He or she should get the responsibility of appointing a wrong person. That’s how the gentlemen should act. Failure of management. If President appointed the cabinet and anyone of that cabinet did something wrong then should take him/her out and be an example to the others. Take the responsibility properly act as a gentlemen. Work as a true government servant. Whoever does the dirty job should get punished. Not only Karuna. According to blogs above, the Sinhala Buddhists used Murderer No 1 to eliminate Murderer No 2. This makes Murderer No 1 a hero !!!!! Does the philosophy of Lord Buddha support this?